Have you heard? For all your holiday needs, we partnered with Paper Source to bring you an exclusive and customizable holiday card collection featuring ELOQUII prints you know and love! 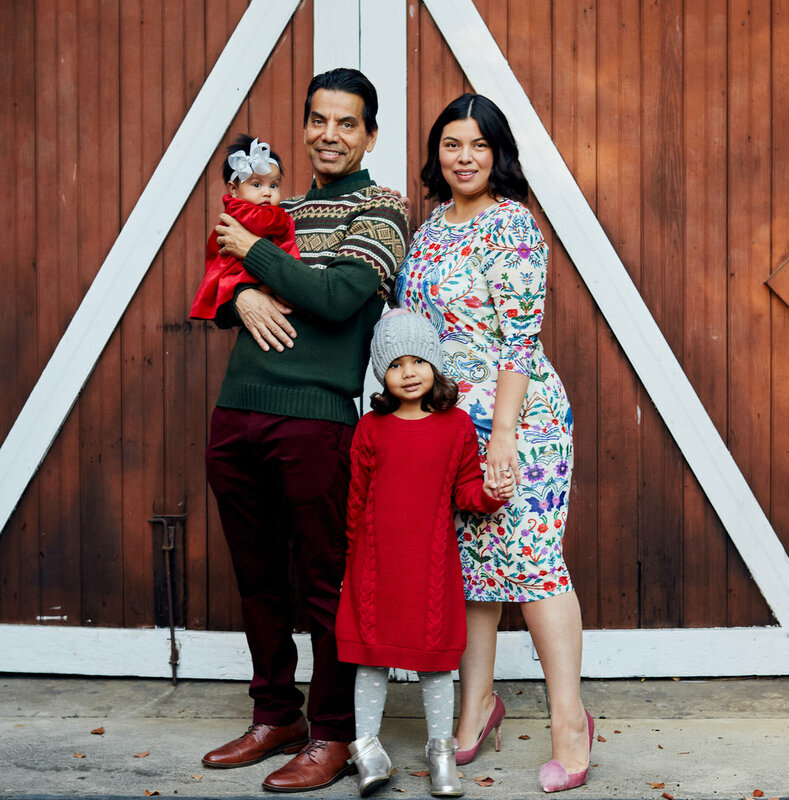 As if that wasn’t enough, we asked our dear friend Jay Miranda (@pinklip) to work with us on her own holiday card for her family! 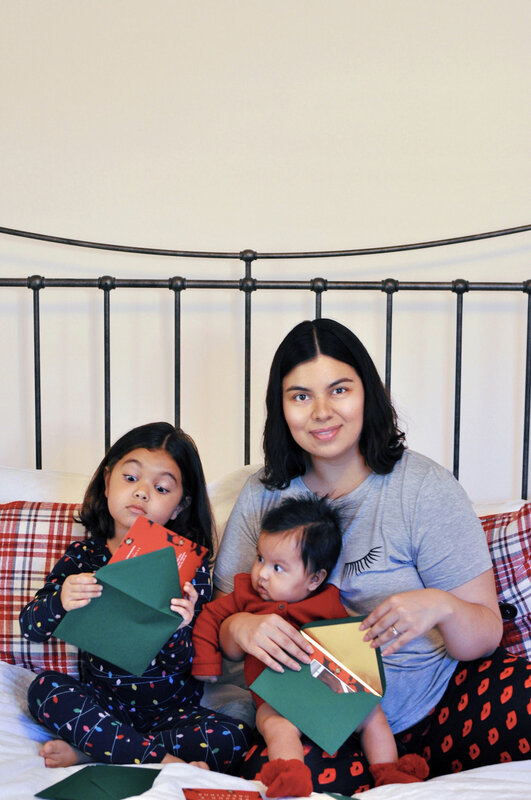 In addition to sharing the most precious holiday pictures ever, we caught up with her to learn how she holidays. Read on to check it out! ELOQUII: What is your favorite part of your ELOQUII x Paper Source cards? JAY: First, I love that we had a couple photo options where everyone was looking at the camera! The ELOQUII patterns are gorgeous and festive and the cards are super easy to customize on Paper Source. I also appreciated the templates and messages that come pre-selected because everything is thoughtfully designed. So it’s great whether you want something completely personalized or just want to choose a beautiful design that’s already been made for you. I also love the envelopes—I got mine lined in gold foil and they feel so special. Do you have any holiday traditions? We’ve built our Christmas tree ornament collection over the years and each one is a reminder of a special moment—a swan from a trip to the ballet one year, a felt mouse our daughter made in preschool, a star to remember a loved one. This year we’re adding a small knitted stocking ornament embroidered with our new baby daughter’s name, Sara. On Christmas morning I make snowman-shaped pancakes with chocolate chip buttons and eyes and a hat and nose carved from an apple slice. Our daughter Julia loves them! What is one of your favorite holiday memories? Last year, the adults in our family decided to forgo presents amongst ourselves, (agreeing to gifts for kids only.) So instead of getting gifts for grownups, we’d make a donation of some kind. My mom is from Guatemala and was spending the holidays there so we decided to give Christmas food baskets to families in need. In the end, we gave food baskets to 40 families. Helping someone else have a happy Christmas is such a great feeling—we’re doing it again this year! What’s one thing you’re looking forward to this holiday season? Slowing down! As my projects wrap up, my husband has time off from work, and my daughter goes on winter break, we’ll be spending so much time together. That translates to slow mornings, baking with my daughter, cooking with my husband, watching movies together, going on walks together. I have so many but one of my favorites is "The Family Man," starring Nicolas Cage and Téa Leoni. It’s kinda like a Christmas version of “Sliding Doors,” minus Gwyneth Paltrow. It asks: what if you’d made different choices in your life, what are the different possible paths we all have? Nicolas Cage gets a glimpse of life where he’s married, has kids, no longer lives in the city, and well, maybe that just resonates with me, ha! Family life comes with some really tough moments and challenges, but I can no longer imagine a timeline that doesn’t include my husband and daughters. I can’t imagine Christmas without them. The movie captures this feeling. Something I need to give myself: committing to a weekly yoga class. It’s been a long time and it’s hard to start from the ground up again, but it’s one of the best ways to spend an hour. What are things you and your family do every year around the holidays? We help our daughter write a letter to Santa. We go to our town’s Christmas tree lighting ceremony. We decorate our tree together. We love Christmas themed books throughout December. One of our absolute favorites is “Great Joy” by Kate DiCamillo. It’s about a little girl who notices a musician on the street who seemingly has no where to go during the holidays. She invites him to her Christmas recital where she has an important line to recite. I can never read the last page without tearing up! What is on your daughters’ holiday wish list this year? Julia asked for “a fancy dress.” Santa already found the perfect one—a red and pink taffeta dress with a big bow at the waist. I can’t wait for her to open it. Sara doesn’t have a list but she’s getting a knit rattle and some soft pajamas. I’m grateful for our new baby, for being a second-time mom (everything is busier, but more I’m more chill about it? ), and for the health of my loved ones. 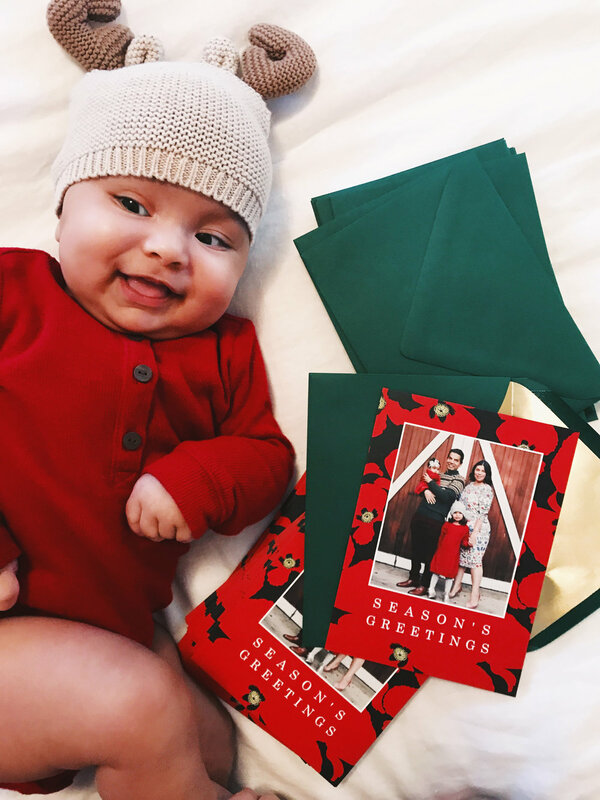 Inspired to create your own holiday cards? Amazing! Shop all our newest holiday arrivals for your #XOQ then check out which card you (and maybe your pup!) want to customize. Happy Holidays!